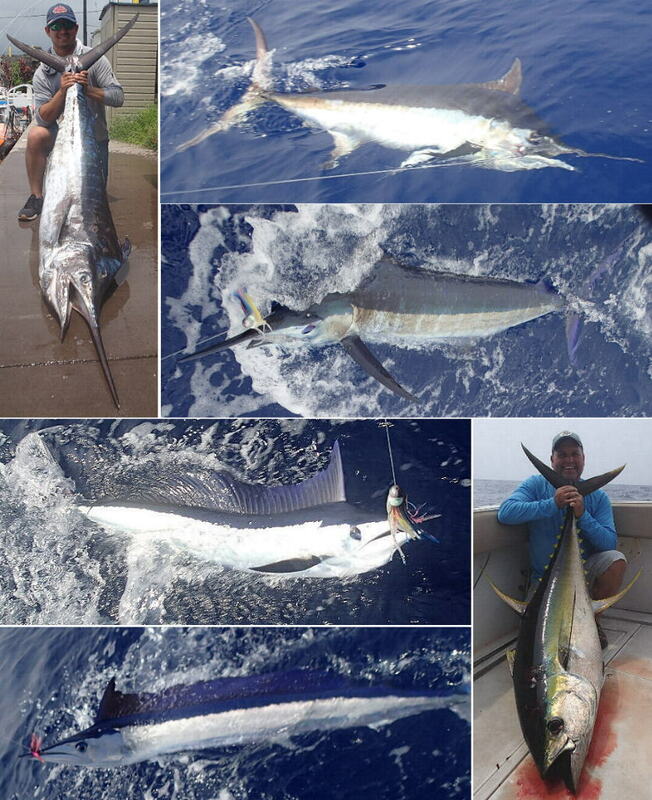 Kona Hawaii Fishing Report – July wrap-up. The blue marlin bite remained good as it should for summer. I made the prediction in last month’s report that the big female marlin would be showing up soon and they did. Not just in Kona but all over the islands. On both Kauai and Oahu, grander marlins were caught just this month where last year, there were no granders caught all year in all of Hawaii. Kona won the World Cup Marlin Tournament this month. A fishing tournament that truly is fished all around the world. The minimum qualifying weight is 500 lbs. and Kona was the only place on the planet to land a qualifying fish. It weighed in at 760.5 lbs. and that also ends (for now) a long standing tie for the most wins. Hawaii and Bermuda are the two top places for a big marlin win and we ended up in a tie for the most World Cup wins in 2007, 2009 and again (and since) in 2014. So with this years win, that puts Hawaii at 9 wins and Bermuda at 8 wins. Yes, the big girls are here but most of the marlin being caught aren’t the big beasts, they’re the smaller males and there’s plenty of them around. Much more than last summer. The blind strike ahi bite remains good with several tunas over the 100 pound mark being caught this month. The smaller otaru tunas are here but not easy to catch. They’re feeding on copepods and really focused in on those but with enough patience, you can usually catch some. The spearfish bite slowed way down but that’s expected for this time of year. The ono bite has really fluctuated this summer but over all, much better than last years summer run. The bottom fishing has been hard to do because the smaller tunas have been hard to catch. Jigging is always an option but using fresh tuna chunks is always more productive and a lot less work. My boat is actually out of the water in dry dock right now. It’s been out for a week now and I’m hoping to be back in the water before the end of this week. I had to haul it out for an emergency repair and as long as I’m out, I’m taking care of some other items that can only be done while the boat is out of the water. It’s those “other items” that may take longer than expected but worrying about it won’t do anything but give me ulcers so even though I’m missing out on a really good marlin bite, I’m trying to take it in stride. The boat is looking very nice with a shiny hull and new bottom paint. When I get back in the water, I hope the fish find it equally attractive! ← Kona Hawaii Fishing Report – June wrap-up.